In the study, researchers, including Wortmann, developed mathematical equations to calculate crop yields as the level of application for a nutrient, such as nitrogen, changes. These equations – called crop nutrient response functions – also consider local soil properties and climate. “They can help determine how much fertiliser to apply based on fertiliser cost, grain value, and money available for fertiliser use,” says Wortmann. This knowledge can help farmers optimise fertiliser use and maximise profits. 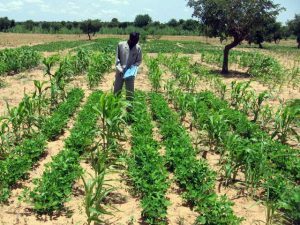 In this study, researchers developed crop nutrient response equations for sorghum grown in Sahel areas in Mali and Niger. The Sahel lies south of the Sahara and has little rainfall. The soil is sandy with little organic matter. Conditions are often harsh and stressful for crops. The researchers determined sorghum responses to several nutrients, including nitrogen, potassium, and phosphorus. Then they used the data to create similar equations for intercropping sorghum and peanut. “Our findings will allow farmers to optimize their fertilizer use during intercropping with little or no additional research,” Wortmann explains. That’s important, because both sorghum and peanut are important vital crops in many parts of Africa. They are used primarily for human consumption. Sorghum is ground into flour and cooked as porridge. It is an important source of energy as well as protein. Additionally, both sorghum grain and the non-grain parts of the plant may be used for livestock feed. Peanuts are commonly crushed and cooked with a vegetable. That provides a good balance of energy from the peanut oil to complement the protein, vitamins, and nutrients provided. “It also makes for a very tasty vegetable dish!” Wortmann adds. With intercropping, the yield of each crop may be lower than if these crops were grown individually. However, the combined yield of the two crops generally exceeds the yield of sorghum or groundnut grown by itself. Intercropping can also benefit farmers in several other ways. If one crop does poorly – due to insects or pests, for instance – the other crop may not be affected. “It can reduce risks associated with farming compared with producing a single crop,” says Wortmann. “Often the unaffected crop may over-perform and compensate for the reduced performance of the other crop.” This is especially important in parts of the world with less food security. According to Wortmann, the findings of this study can be applied to areas beyond the Sahel. “I think our results can help farmers in other areas of West Africa and also in parts of southern Africa where sorghum-peanut intercropping is important,” he says. “The research findings have already been integrated into decision tools for optimization of fertilizer use,” says Wortmann. Farm advisors and farmers are being taught how to use tools. Read the paper in Agronomy Journal: Sorghum and Groundnut Sole and Intercrop Nutrient Response in Semi-Arid West Africa (£).